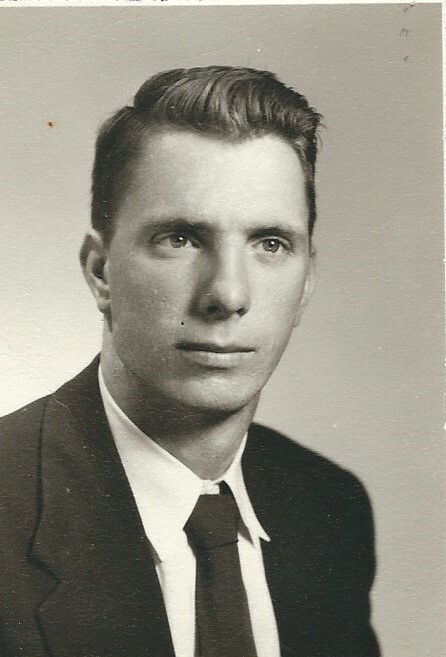 Samuel Fulton Carr, 84, of Tiverton, RI, passed away on April 4, 2019, at home, surrounded by his loving family. Samuel was born on September 3, 1934, in Arlington, MA, the second of three sons to John A. Carr and Margaret C. Carr. Samuel is survived by Ann (Jones) Carr, his beloved wife of 63 years, along with five daughters: Margaret A. Carr of Warwick, RI, Elizabeth M. Carr of Tiverton, RI, Catherine S. Aguiar and husband, Brian, of Tiverton, RI, Charlotte F. Cirillo and husband, Peter, of Tiverton RI and Patricia A. Phillips and husband, Jason, of Dartmouth, MA. He is also survived by six cherished grandchildren: Ryan S. Carr, Nicole E. Drake, Connor L. Phillips, Ian S. Phillips, Cole A. Cirillo and Chace C. Cirillo; his brother, Robert B. Carr of Sanford, ME, and many nieces and nephews across the country. Samuel is preceded in death by his brother John A. Carr III of Weymouth, MA. A graduate of Boston College High School, Samuel earned a bachelor’s degree in English in 1957 from Boston College. Samuel then started his 21-year career as an officer in the U.S. Navy, where he served as a Naval Intelligence Officer. During his military career Samuel completed Naval Justice School (JAG), earned an MBA from Rollins College in Winter Park, FL, and completed post graduate studies in International Relations in Washington, D.C.
LCDR Samuel F. Carr USN (RET) served in many roles, including Senior Intelligence Officer on the USS Kitty Hawk during the Vietnam War, and Senior Operational Intelligence Officer to the Commander of the Patrol Forces Atlantic. Upon retiring from the U.S. Navy, Samuel continued to work in security and intelligence for the U.S. Defense Industry in various positions at Sperry Univac, ORI and General Dynamics. In addition, he was a part-time college professor at Bryant University, and a freelance writer for a several publications including The New York Fisherman, Field and Stream Magazine and the Newport Daily News. Samuel was also the District Director for the RI District Office of the U.S. Small Business Administration, helping people fulfill their dreams of owning their own business. Samuel belonged to a number of organizations including the: Tiverton Harbor Commission, Outdoor Writer’s Association of America, Ducks Unlimited, Newport Chamber of Commerce, Society of Logistics Engineers, (SOLE), and Department of Environmental Management. Sam was an avid hunter and fisherman. He enjoyed boating, lobstering, and baseball. He loved the outdoors and spending time with his family and will be sorely missed. Calling hours will be held on Friday, April 12, 2019, from 4:30-7:30 pm at Connors Funeral Home, 55 W Main Rd, Route 114 in Portsmouth, RI. Funeral services will be held on Saturday, April 13, 2019, at 11 am at St. Ann’s By the Sea at 591 Ocean Street in Marshfield, MA. Burial will be at the Cedar Grove Cemetery at 1980 Ocean Street, Marshfield, MA immediately following the funeral mass.